Visual Basic array is a set of elements which is stored in the single variable and can be accessed by index. Arrays is a set of the fixed size. Size can be assigned while declaration. The single number between the parenthesis represents the upper boundary of the array. By default arrays are 0-based. So specifying (5) as array size means that there will be 6 elements in the array. It is recommended to use 0-based array as it is a common practice across different programming languages. Array elements can be accessed and changed by their index. If specified index is outside of the boundaries of the array, run-time error is raised. In some cases size of the array cannot be known at the compile time and it will be identified during the run-time. In this case array can be declared without the size (i.e. not initialized). Such array can be then resized dynamically using the ReDim keyword. In order to retrieve the upper and lower boundaries of the array UBound and LBound can be used respectively. UBound function cannot be used to identify if the array is initialized as it will throw an exception when used on not initialized array. Use the IsArrayInitialized function from the example below to safely identify the state of the array. Debug.Print "Array is initialized = " & IsArrayInitialized(intArr) & " of size " & GetArraySize(intArr) & " (" & LBound(intArr) & " to " & UBound(intArr) & ")"
Array elements can be treated as individual variables and the same rules of reading and editing the data applies to array elements as any other variable. Refer Variables article for more information. ReDim keyword allows to resize the array. In this case all existing values will be cleared. In order to keep the existing values of the array it is required to use ReDim Preserve keyword. 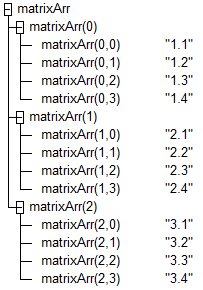 2-dimensional array can be resized, but if it is required to preserve the values only second (column) dimension can be resized.